New penning will allow increased customization of swine production equipment to meet producers’ needs. January 9, 2013 – Osborne, KS – Osborne Industries, Inc. has unveiled new confinement-building penning as an addition to its growing line of swine production equipment. The addition of Osborne’s penning ties into its “Single Source Swine Solutions™,” an innovative line of swine management products, equipment and services for the global swine industry. With nearly 40 years of experience in the industry, Osborne will utilize the farrowing pen to further increase its ability to customize projects to producers’ specifications. Powder-coated to maximize longevity, Osborne’s new penning for nursery, wean-to-finish or finishing buildings features eight horizontal, solid-rod bars with a reverse L-angle top. 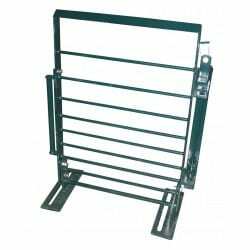 The penning features shepherd hooks and flip latch locks to assist in easy entry into pens. The bottom bar and floor plate are thickened to help withstand corrosion. Osborne’s new penning is designed to maintain the strength needed for heavier finishing weights, and to help producers overcome the most common maintenance challenges that frequently detract from time they invest in caring for animals. The penning was custom designed by Osborne engineers to perform successfully in nursery, finishing and wean-to-finish operations. “We understand that have choices as to where to buy new equipment. By choosing Osborne, producers can rest assured that our swine production equipment will deliver top-quality performance, allowing more time and energy to be spent on animal care and attention,” said Vicki Corbett, Customer Service Manager at Osborne. Osborne Industries of Osborne, Kansas, USA, is a 100% employee-owned company specializing in the manufacture and development of advanced livestock management equipment and turn-key services for the worldwide swine industry. For more information about Osborne, its new penning options, and its innovative “Single Source Swine Solutions,” visit osbornelivestockequipment.com or e-mail info@osborne-ind.com.